Campaigning for a smarter, more humane approach to crime that saves lives and builds safer communities. The over-representation of Aboriginal and Torres Strait Islander peoples in the criminal justice system is one of the most significant social justice issues in Australia, with the proportion of Aboriginal and Torres Strait Islander peoples in all stages of the criminal justice system far exceeding their representation in the community. Aboriginal and Torres Strait Islander people comprise 3 per cent of the Australian population and they make up 28% of the total prison population, that is an imprisonment rate 13 times higher than the non-indigenous rate. Aboriginal and Torres Strait Islander people are also 7.9 times more likely to be taken into police custody than non-Aboriginal and Torres Strait Islander people and are 12 times more likely to be in community based correction programs. The rates of incarceration for Aboriginal and Torres Strait Islander people are worsening. Between 2001 and 2010, the imprisonment rate for Aboriginal and Torres Strait Islander women increased by 59% and Aboriginal and Torres Strait Islander men by 35%. Aboriginal and Torres Strait Islander women now represent the fastest growing prison population in Australia with an increase of 20 per cent in the last 12 months alone. Tough on crime campaigns that promote increased or mandatory sentences as the way to protect the community rely on the myth that harsher sentences deter reoffending. Yet the evidence shows that prison fails to deter, rehabilitate, meet public concerns and make communities safer. We need to move beyond "tough on crime" approaches to a "smart on crime" solution-focused approach to justice. We need a dedicated focus on reducing incarceration from all levels of government, and done so in real partnership with Aboriginal and Torres Strait Islander representatives. Government should set targets through the Council of Australian Government's (COAG) framework for Closing the Gap in Indigenous disadvantage and implement a justice reinvestment approach. ANTaR is a founding member of the Change the Record Campaign launched April 2015. Change the Record is a national campaign to address the disproportionate rates of incarceration of Aboriginal and Torres Strait Islander people and the high levels of violence experienced, particularly by women and children. We need to invest in early intervention, prevention and diversion strategies. These are smarter solutions that increase safety, address the root causes of violence against women, cut re-offending and imprisonment rates, and build stronger and safer communities. We can do this and reduce the cost for all of us as taxpayers. To Change the Record, we need to work with Aboriginal and Torres Strait Islander communities to invest in holistic early intervention, prevention and diversion strategies. These are smarter, evidence-based and more cost-effective solutions that increase safety, address the root causes of violence against women and children, cut re-offending and imprisonment rates, and build stronger communities. Find out more about what's needed to change the record. Don’t let the Royal Commission into the Protection and Detention of Children in the Northern Territory gather dust! For 26 years Federal, State and Territory governments have failed to implement the recommendations of the Royal Commission into Aboriginal Deaths in Custody. Just over 12 months ago, the nation was shocked out of its complacency by the horrific revelations of abuse of predominantly Aboriginal children inside the Don Dale Juvenile Detention Centre in the NT. This resulted in the establishment of the Royal Commission into the Protection and Detention of Children in the Northern Territory. The final report, released on the 17th November, is a critical moment to pressure government to take national action to address the appalling overrepresentation and treatment of Aboriginal and Torres Strait Islander children in prison. In the last 12 months we’ve seen and heard distressing allegations of physical and sexual abuse in Cleveland Detention centre in Queensland, Barwon prison in Victoria, Bimberi detention centre in the ACT and Reiby detention centre in NSW, and Western Australia. We need national action to address this national crisis. We need national leadership. Working as part of the Change the Record Campaign, we’re pushing for a national plan of action. We cannot let this be another report that gathers dust, with little or no government action. Stand with us and demand change so we stop another 26 years of government failure and a generation being lost behind bars. Sign the petition to implement the 8 point plan for national action. Already 2,499 of 3,000 signed the petition. Dear Prime Minister Turnbull, Since your government established the Royal Commission into the Protection and Detention of Children in the Northern Territory, serious findings and allegations of abuse of children in prison have emerged in every state and territory. We cannot escape that this is happening to Aboriginal and Torres Strait Islander children, who are 25 times more likely to be imprisoned than non-Indigenous children. National leadership is long overdue. Now is the time for the Australian Government to work with state and territory governments through the Council of Australian Governments (COAG) to achieve this change, building on the findings of the Royal Commission’s final report. It is critical that this report is not shelved or ignored, like past inquiries. 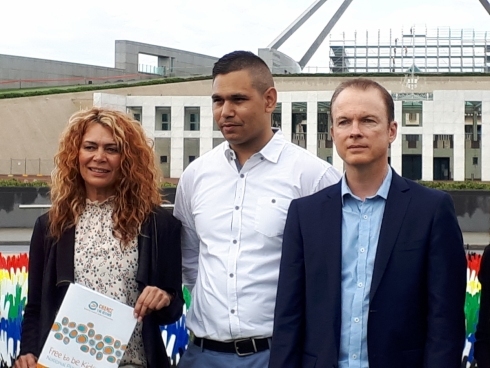 We call on the Australian Government, in partnership with Aboriginal and Torres Strait Islander people and communities, to develop, resource and implement a National Plan of Action that includes: 1. Supporting children, families and communities to stay strong together 2. Raising the minimum age of criminal responsibility to 14 3. Getting children who are not sentenced out of prison 4. Adequate funding for Aboriginal and Torres Strait Islander community-controlled legal services and other support services 5. Ending abusive practices in prisons 6. Setting targets to end the over-representation of Aboriginal and Torres Strait Islander children in prison 7. Improving collection and use of data 8. Working through COAG to reform state and territory laws that breach children's rights This plan must have the support of all sides of government, at all levels, to achieve real change. We owe it to the Aboriginal and Torres Strait Islander kids who have spent their childhoods behind bars and the next generation to ensure that they are supported to thrive in their communities, not suffer behind bars. We urge you to show national leadership at this historic opportunity for change. Just over three years ago a 22 year old Yamatji woman with her whole life ahead of her - Ms Dhu, died in a Western Australian Police lock up from a fatal infection stemming from a cracked rib arising from a family violence injury. Ms Dhu had been locked up for unpaid fines for three days. She was treated inhumanely by police while in custody. This tragic death was preventable. The impact on Aboriginal and Torres Strait Islander people of being put behind bars unnecessarily is devastating and was recognised more than 25 years ago by the Royal Commission into Aboriginal Deaths in Custody. Had the recommendations of the Royal Commission been implemented, Ms Dhu would still be alive today, and over-imprisonment of Aboriginal and Torres Strait Islander people wouldn’t be devastating communities. Aboriginal and Torres Strait Islander women made up 64% of the female fine defaulter prison population. Following the tragic death of Ms Dhu, the WA coroner recommended that there be no imprisonment for unpaid fines and that the WA Government investigate a Custody Notification Service similar to that operating in NSW and Victoria. These recommendations have not yet been implemented by the newly elected Western Australian government. Sadly, the laws and practices that contributed to Ms Dhu’s death are reflected around Australia and contribute to more Aboriginal and Torres Strait Islander women and men being fined and locked up for minor offences. Governments across Australia must act now to remove laws that disproportionately and unfairly criminalise Aboriginal and Torres Strait Islander people. Take action now by writing to State and Territory Premiers/Chief Ministers and Attorneys General to tell them to stop locking up people for unpaid fines, and introduce a custody notification service for Aboriginal and Torres Strait Islander people. We cannot let the tragedy of Ms Dhu be repeated.